This article is about an architectural feature. For other uses, see Stoa (disambiguation). 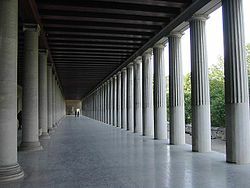 A stoa (/ˈstoʊə/; plural, stoas, stoai, or stoae /ˈstoʊ.iː/), in ancient Greek architecture, is a covered walkway or portico, commonly for public use. Early stoas were open at the entrance with columns, usually of the Doric order, lining the side of the building; they created a safe, enveloping, protective atmosphere. The name of the Stoic school of philosophy derives from "stoa". The Stoa of Attalos, with busts of historical philosophers. (Picture by Massimo Pigliucci). ^ Jeffrey Becker. "Introduction to Greek architecture". Khanacademy.org. Retrieved 10 March 2016. Look up stoa in Wiktionary, the free dictionary. "Stoa" . Encyclopædia Britannica (11th ed.). 1911.